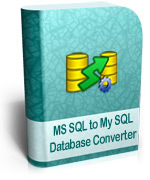 Easy to use and non-destructive MSSQL to MySQL Database Converter Software is focused towards converting the created MSSQL database records into MySQL database by maintaining the database functionality. The database conversion software is specifically developed for all the database administrators and database programmers so as to convert the database created in MSSQL format to MySQL format. The database conversion utility allows its users to overwrite the records of existing database records with the converted database records or save the converted database records on the disk at user specified location for future purposes. Database Conversion tool converts the database records created in MSSQL to MySQL database format with full accuracy. The data base file converter utility is easy to use and secure tool.